Internetaccess has evolved into something as common as running water flowing through your kitchen faucet . We've got mobile internet,different kinds of cable-bound internet via DSL or fiber . As a traditionalist I prefer cable for the stability of it, no loss of signal or risk for interference . At least for some kind of services like the broadband at home or work. WiFi access points are a welcome addition to the cabled connection. When it comes to general tasks as web-browsing,paying the bills or watching cats the WiFi option works fine. When it comes to gaming or streaming media the preferred connection type is via cable, for stability and bandwidth. Now, chances are there has not been a TP Cable outlet installed in every room of your house or in the flat you are living in. This is where the Zyxel Powerline HD comes to the rescue. The Zyxel Powerline HD enables you to transport data traffic from any power outlet in your living quarters to any other power outlet. Data transfer speed being 600mb/s makes even the most challenging HD stream child's play for the Power line . Setting up is easy, just plugin one of the two Powerline adapters in a wall outlet near your internet modem /access point/router . Then connect one of the two following TP cables to the Powerline HD and plugin the other Power line adapter where you need the internet connection and use the second TP cable to connect your gaming console/PC/smart tv/whatever . 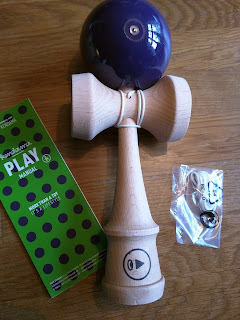 Instantly you get connection. There is also a encryption option (sha128 )if you're on the paranoid side of things and don't want eavesdropping on your traffic. Installing was without any issues. 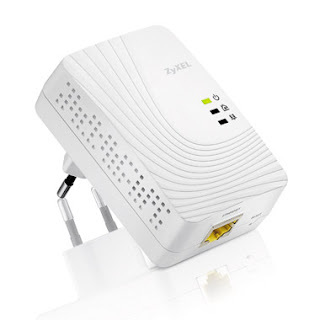 The design of the Zyxel HD PL is made so that you can still use the wall outlet being utilized for internet traffic. Throughput enabled in other words. Although the outer dimension made the second wall out let ( coming in pairs in the house we live in) be a bit obstructed. Size matters and luckily Zyxel has made equivalent Powerline adapters with a smaller outside measure.This one being called HD Powerline 5205. See the image below for that. So how is the throughput then? Since Androidistica is all about doing tasks on android it felt natural to do some bandwidth test on a media streamer connected to a TV. On a 24mb/s downstream connection the speeds measured was on 8 mb/s. Being an old house,the broadband ADSL modem located on a different floor I'd say it's OK. The HD powerline adapter works without hiccups. Three LEDs on the front gives you a visual status of what's going on. If there's traffic going through,the quality of the traffic represented by green,amber or reds. Another thing that comes to mind is powerconsumption. 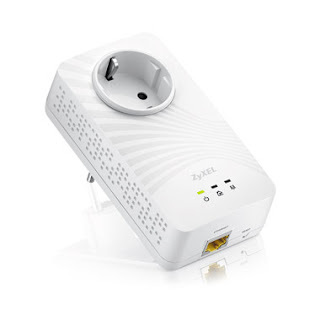 As soon as you don't use the connection the Zyxel HD Powerline goes into 'low-power consumption mode'. As little as 0,5 W on standby. When you start using the internet again the reconnection is instant. No lag here. Zyxel has a wide range of peripherals going well together with this HDPower line starter kit,such as WiFi N access points, switches and lots more. For it's intended use the Zyxel HD Powerline performs it's job well. Solid build quality on the power adapters, an easy quick start guide, a CD ROM with documentation and a small piece of utility software. Zyxel has nailed it with this one, if you're in the market for some power line installations in your home or in your office make sure to check this one out!